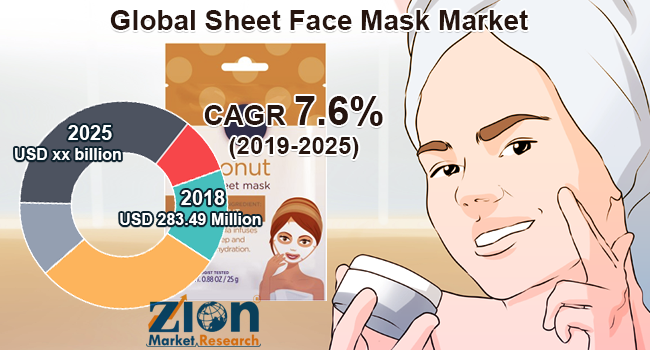 Zion Market Research has published a new report titled “Sheet Face Mask Market By Distribution Channel (Online and Offline), By Product Type (Cotton, Non-Woven, Hydrogel, Bio Cellulose, and Others), By End-User (Business to Business and Business to Customers), and By Price Range (Premium and Economic): Global Industry Perspective, Comprehensive Analysis and Forecast, 2017 – 2024”. According to the report, the global sheet face mask market was valued at around USD 267.91 million in 2017 and is expected to reach approximately USD 449.61 million by 2024, growing at a CAGR of around 7.62% between 2018 and 2024. Sheet face mask is a dual structured sheet which has a coating of powerful foil. It prevents skin form anti-aging, pollutions, damaging, etc. The sheet mask improves the uneven skin tone. It allows ingredients to penetrate deep into the skin. It is mainly used for brightening and hydration of skin tone also for deep cleansing. The advantage of using sheet face masks is that it prevents skin damage and helps to get a glowing skin. Improving economic conditions in developing countries will create a new mark for beauty and skincare product manufacturers in the forecast period. Price competition and increasing demand will create major challenges for the sheet face masks manufactures. The sheet face mask market is anticipated to witness significant growth within the forecast period. The market is mainly driven by growing demand for protection against clinical hazards, increasing demand for organic products, and rising disposable income in emerging countries. The sheet face masks market is growing towards the high value-added product in cosmetic and personal care uses. Sheet face masks provide several skincare benefits and convenience; pollution issues in many countries in the developing regions will increase the use of sheet face masks. Growing concern about skin protection is also expected to boost the growth of the sheet face mask market during the forecast period. Government rules and regulations on the quality and the price of the products may hinder the global sheet face mask market growth over the forecast period. Sheet face mask is designed for single use only and they come up in plastic packaging. Disposing of sheet face masks products may affect the environment. The global sheet face mask market can be segmented on the basis of the distribution channel, type, end-user, and price range. The distribution channel is bifurcated into online and offline. Sheet face masks are available through two major distribution channel, offline channel and online channel. Based on the estimation, the offline demand for face masks is higher than online channels. Facial sheet masks remained the biggest contributor to skin care growth, accounting for nearly 40% of total online sales of the segment last year. Depending on product type, the sheet face mask market is classified into cotton, non-woven, hydrogel, bio-cellulose, and others. The cotton fabric had the largest market share in 2017 due to its soothing properties. Nonwoven sheet face masks are cost effective and have the capacity to refill moisture to the skin. Hydrogel fabric sheet masks are the most expensive type of sheet face masks as they are made of slicker material. The end-user segment includes; business to business and business to customers. In terms of value, the business to customers segment dominated the global sheet face mask market in 2017 followed by the business to business segment. The price range segment includes premium and economic. Most leading brands are focusing on manufacturing sheet face masks at premium pricing. Many companies are manufacturing sheet face masks for the market at a lower price to target the younger generation between 15 and 30 years of age. The regional segmentation includes North America, Europe, Asia Pacific, Latin America, and the Middle and Africa. In 2017, Asia Pacific was the most dominating region in terms of demand for sheet face mask market due to increasing skincare awareness among the young generations. Sheet face masks hydrate and moisturize the skin which helps in reducing skin dryness and also decreases the damage to skin cells. Due to this, developing countries in regions such as the Asia Pacific are projected to have the highest CAGR over the forecast period. Market growth is mainly due to the innovation of hydrogels and fabric materials in sheet face masks which improves its functionality. As compared to other materials, hydrogels have a better ability to protect and also allows the skin to absorb ingredients efficiently. In the Asia Pacific, China represents the highest growth rate for the sheet face masks market due to its innovative product offering strategy. In North America, the U.S. is the largest market which experienced stagnant growth for the sheet face mask market. Europe accounted for 8.8% of CAGR over the coming period due to rising quality of life. The Middle East and Africa are anticipated to be the growing market for sheet face masks owing to the skincare precautions taken by consumers in the Middle East and Africa. The leading players operating in the sheet face masks market include Lancome Paris, Star Skin Beauty Group AG, Kracie Holdings, Ltd., Estee Lauder, DECLEOR Paris, BioRepublic Skin Care, Sephora Inc., 3LAB Inc., Boss Biological Technique Ltd., Yunos Co. Ltd., The Face Shop, Tonymoly Co. Ltd., Innisfree Corporation, ES Cosmetics, and many others. The report provides a detailed description of manufactures which consist of parameters, for example, company overview, business strategy, key developments, and financial overview of the company.